The rapid industrialization of the nineteenth-century contributed to an ever expanding world, a bigger world now open for study. Increased interest in science, particularly natural history, brought pieces of this world into people’s homes and on their person. Ferns and terrariums became common in parlors, as were aquariums, taxidermy, and shell collections. This penchant for collecting naturalia goes back to the curiosity cabinets of the Renaissance, but it was the Romantic movement at the end of the eighteenth century that paved the way for everyone to become a bit of a naturalist in the Victorian period. Natural specimens were not only found in personal parlors, but for public viewing in the many natural history museums opening. It was only natural people began wearable collections. 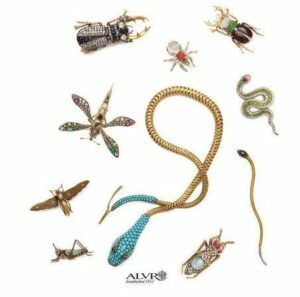 Our exhibition certainly attests to the profusion of insect jewelry in this period, encouraged by the rise of entymology in the middle of the nineteenth-century. Darwin, too, and his theory of evolution certainly encouraged interest in the natural world, altering man’s relationship with flora and fauna. 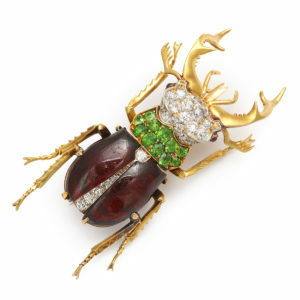 One wonders what Darwin thought of the bejeweled critters worn in his own time, and now, clearly survivors of the fittest, on display in our exhibition. Also on view are Fabergé animals and fine art, including drawings by Alexandre Iacovleff. Stay tuned the next few weeks for more background information on these exhibition highlights. We invite you now to become a naturalist – come into our parlor for a look at these bejeweled specimens of natural selection.